Our experiment idea is to find out, if one can navigate with a compass in space. The aim of our experiment is to find out if it is possible to determine the location (latitude) of the ISS just by measuring Earth’s magnetic field. We plan to make a comparison with this calculated, experiment based position and the true position of the ISS. We are planning to use Astro Pi’s magnetometer to measure Earth’s magnetic field during two orbits. With the data we can make an estimate of the location (latitude) of ISS. We will also take timestamps of each magnetometer measurement and with the ISS tracker web page we can compare our measurement results to the true position of the ISS. One of the coding wizard students in our team has made extensions to chrome browser, so that we can easily collect data from web pages, including the position of ISS (http://www.isstracker.com/) and Earth’s magnetic field (https://www.ngdc.noaa.gov/geomag-web/#igrfwmm). We also plan to use the LED matrix to display messages celebrating our school, which is 100 years old in 2018, and the 100 years of independence of Finland in 2017. Our team name is Team Aurora, and our team consists of 3 boys and 2 girls of age 17-19. Some of our team members have lots of experience in coding and others have less. Teacher will help the beginners to code the LED matrix. The most experienced coders will code the magnetic field measurement. Our school is government funded upper secondary school, founded 100 years ago. Hyvinkää is located approximately 50 kilometres north of the capital Helsinki and the population is about 47 000. I am a teacher of physics and mathematics, with a bit over 10 years of work experience. 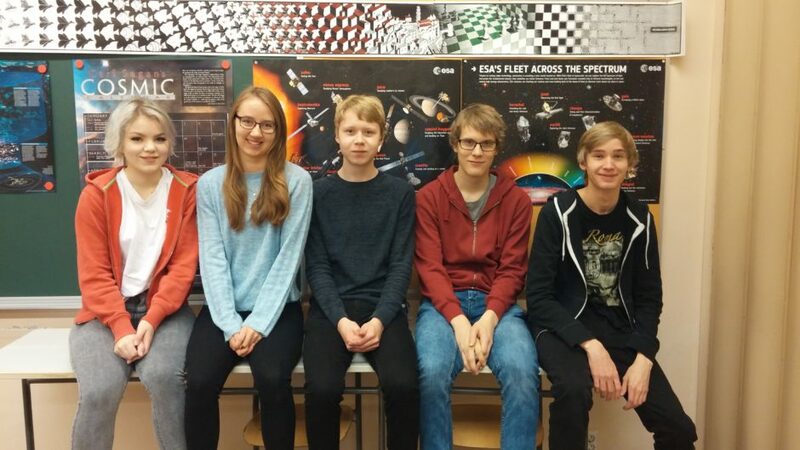 Picture of Team Aurora, from left: Onika Åberg, Mimosa Lindfors, Ilari Tulkki, Joni Koskinen and Tommi Korpelainen. Thanks to team Aurora and good luck in the competition!